The Battle of Neuve Chapelle was fought between 10-13 March 1915 and was originally intended to comprise part of a wider Allied offensive in the Artois region. However, Neuve Chapelle was launched as a distinct action in its own right owing to the late arrival of relieving British troops for Ypres, due to the redirection of effort towards Gallipoli. 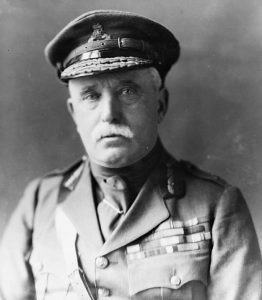 The decision to attack Neuve Chapelle, situated north of La Bassee and west of Lille in north-west France, was Sir John French’s, Commander-in-Chief of the British Expeditionary Force (BEF). Whilst Neuve Chapelle was to form the initial target of the assault, French (pictured right) intended to capture the village at Aubers a mile to the east and to press the German defence of Lille. In achieving these aims French wished to reduce the small German salient near Neuve Chapelle. Douglas Haig’s First Army was to lead the attack. Four divisions totalling 40,000 men were committed along a 3 km front at 7.30am on the 10 March. The infantry advance was preceded by a concentrated 35 minute artillery bombardment launched from 342 guns across a 2,000 yard line. This bombardment would be directed in part by 85 reconnaissance aircraft from the Royal Flying Corps (RFC). 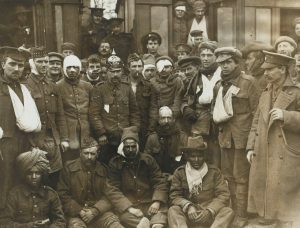 Carefully co-ordinated attacks which often involved hand-to-hand fighting by British and Indian infantry were successful in quickly breaking through a section of the German line secured by only a single division of Crown Prince Rupprecht’s Sixth Army around the village of Neuve Chapelle. In just four hours the village was taken and secured. However, having achieved a real gain in the capture of the village, supply and communication problems began to plague Haig’s troops. Rupprecht dispatched reserves to Neuve Chapelle, launching a counter-attack on 12 March. 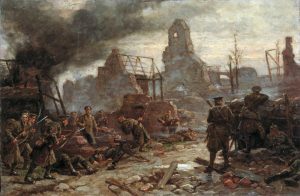 Nevertheless, the British troops managed to hold their gains which consisted of some 2 km of ground originally lost in October 1914, but further progress towards Aubers, which had escaped artillery bombardment and where the front line wire was thus undamaged, proved impossible to take. Of the 1,000 troops who attacked Aubers, none survived and the attack was consequently halted on the 13 March. Allied casualties during this battle were high totalling 11,200 (7,000 British, 4,200 Indian). The losses among the German Sixth Army were roughly similar, although 1,200 German troops were taken prisoner by the British. Sir John French blamed a shortage of artillery shells for the lack of success beyond the initial advance, intending to stockpile greater quantities for use in future preliminary bombardments. However, in extending the duration of such bombardments the vital element of surprise was lost, giving the Germans valuable additional time in which to rush reserves to the site of the bombardment. 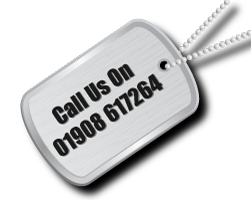 For details of our WW1 battlefield tours, call us on 01908 617264.